Our 2019 Scholarship is now open! Jobs for Youth Scholars receive $1500 for their vocational or higher education goals. 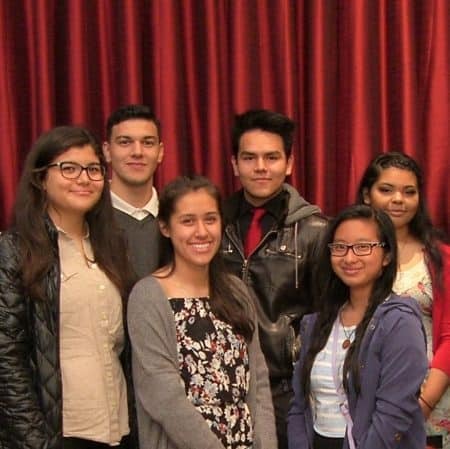 *Youth who have not yet participated in a Jobs for Youth workshop can email us at jobsforyouth@smcgov.org for upcoming workshop dates. 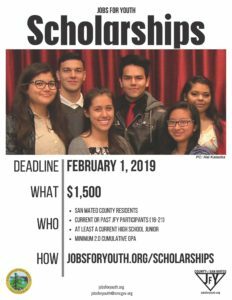 Submit application packet via email (jobsforyouth@smcgov.org) with “JFY Scholarship Application” in the subject line. Cover page with your name, phone number, address, birth date, school, graduation date, and email address. Two color headshots of yourself – These photos will not be included in our evaluation process but will be used in our communications if you receive an award. Additionally, you must have two professional references submit letters directly to Jobs for Youth by the February 1 deadline. Letters should be submitted via email to jobsforyouth@smcgov.org with your full name in the subject line. Scholarship essays are evaluated based on the criteria above. Submitting a similar essay from previous years will not be accepted. Students with Individual Educational Plans (IEP) have the option of submitting a two and a half minute video application essay and emailing it directly to jobsforyouth@smcgov.org. IEPs must also be emailed by the deadline date.